MootjArt: Animalfriendly art, design, deco and accessories of the reused paper. With the rapid digitalisation, millions of books and magazines are thrown away or at best recycled. MootjArt's mission is to reuse these books. Well, not all of them ... The company gives new life to these books and magazine and makes them into art, handbags, bijoux and home decoration. And not only do they save books, they save animals as well because they do not use leather, silk or wool. Apart from that, MootjArt thinks that exclusive art and fashion, does not need to cost a monthly salary. Mo, short for Monique, is the founder of MootjArt. (Mootje means little Monique in Dutch) Born in the Netherlands in the 60s, she now lives in France with her friend Ernie, trying to make the world a better place. Always on the lookout for a new challenge, Mo was looking for a way to make an animal-friendly handbag. The strong paper folding technique makes this possible and the reuse of the old paper matches exactly with her ideas and even better, it means that the bags are vegan! And apart from MootjArt, she loves animals, she is vegan and she plays guitar, yeah kind of a hippie. Ernie supports Mo with the technical challenges and he created and maintains this website. 1. When and why did you leave the Netherlands? In 2000 we left because of nature disappeared in the Netherlands and the country became fuller and busier. In the Corrèze we found that peace and nature again. 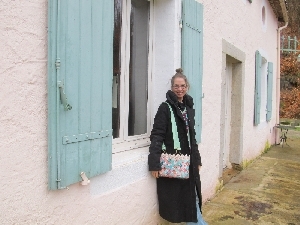 Since 2015 we have been living in the Hérault in Verreries de Moussans a stone's throw away from Labastide-Rouairoux, where I started to make animalfriendly art and bags from recycled paper. 2. What did you do for a living in the Netherlands and did you have a job in France? In the Netherlands I was a residential consultant at a housing association and in France I have written books for ten years. 3. And now you put your own books in art? Oh no, not my own books! I am passionate about reusing and I've always liked creativity. I don't like throwing away books, in this consumer society we are already throwing away too much. Apart from books I especially use "glossy" magazines. 4. What is the main activity of your company? 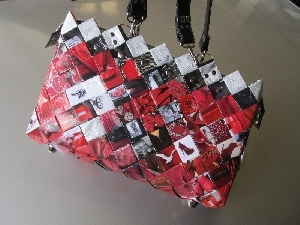 My bags are in great demand and I give workshops to creative associations. 5. Why don't you just make bags from leather? As a vegan, I have always been looking for alternatives to leather. Leather products are environmentally polluting our planet. Both in the production of leather and in the processing of leather. Consider also the food that animals that produce leather need and the manure they produce. I also find the abuse in the animal industry horrible. In addition, there are very good alternatives for leather and one of them is paper. 6. How do you come up with this idea of recycling? In January 2017 I discovered this ancestral technique that origins probably in Mexico. I adopted it in my own way and so I create my surprising and exclusive art. But it is not recycling, it is reuse. I use the paper as I find it in its original form. 7. How does this weaving technical work? It's not braiding or weaving, it's a folding technique a bit like origami, very precise and meticulous, it's a real close work. I save all sorts of paper like magazines, sheet music, publicity flyers, catalogues and chocolate tablet wrappers. I cut hundreds of small squares following a colour or theme to find the harmony a client asks. Then I'm cutting strips of paper and I glue the squares onto the strips. I laminate these strips by hand, I fold the strips together and they are then sewn together and a design object is born. 8. What a donkeys job! Yes, for a big bag I need 400 squares and that costs me a week. 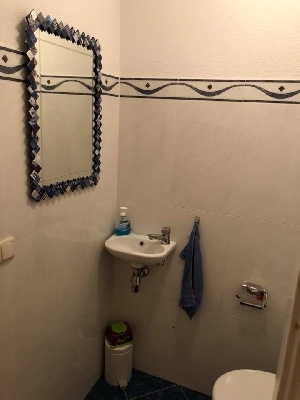 I also make the handles and the inside myself. 9. Is this technique strong and waterproof? Yes and yes. When a strip is ready, you can pull on both sides with two people. It's flexible and at the same time very strong. 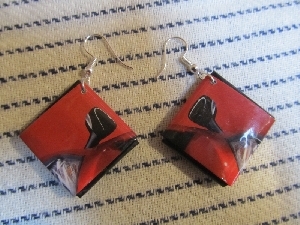 And if I were you I wouldn't shower with the earrings, but the technique, due to the lamination, can substain rain and it can also be cleaned with a damp cloth. 10. What are your expectations? 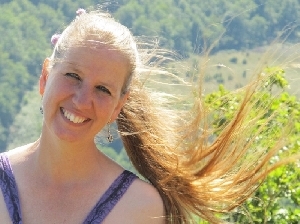 You are past 50, why do you start a new business? Colours are my passion and I'm a bit addicted to this technique, especially since it's so innovative and everyone is extremely enthusiastic about my designs. The fact that I personalize the bags according to the wishes, colour and personal pictures of the customer, strikes people the most. I am creative, my strengths are my originality and this innovative sustainable technology. My expectation is that within the year in the Herault my original bags, art, decoration and earrings will be for sale in a lot of boutiques. Started with incubator service for registration of the company. Big failure. First of all a work of art of MootjArt is made with love. Each square starts with a little heart. 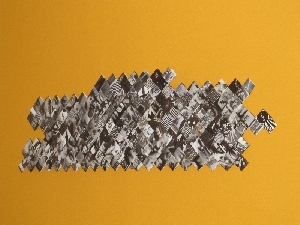 For a bag or other piece of art, hundreds of recycled paper strips are laminated by hand and folded with a technique like origami and made into strips. The strips are sewn together and thus converged into an unique design. No piece of MootjeArt is the same. A square takes about 5.5 minutes to make, with nearly 400 squares in a big bag, such a bag takes a week. After that the handles and the inner lining are sewn with and attached with rivets.